A few weeks before Christmas, my family visited our friend’s church to hear him preach the Sunday sermon. The church is a cutting edge, “seeker-type” that contrasts pretty strongly with our more traditional United Methodist church. We got our kids checked into the childcare and proceeded into the windowless, theater-style auditorium, pulsing with very contemporary music that was so loud, my chest literally reverberated painfully with the noise. Jeremy and I looked at each other wide-eyed, feeling old and uncool, probably due to our lack of man-bun or ironic attire that seemed to be a prerequisite for attendance. While we have attended a WIDE variety of churches in the past 15 years, including several of this very style, the past two years in a more traditional setting made us feel sorely out of place with the hipsters. I screwed my mouth into a look of disapproval and gestured that I wanted to move back in the theater–away from the pulsating speakers that were giving me heartburn. Our friend started talking, and wouldn’t you know, the sermon was about our words. He talked about how the average person receives 6 messages for every one positive message. WHAT?!?! He talked about how those messages affect us. He talked about being critical or being encouraging. And he focused on a Scripture that I’d never associated with words before. He encouraged us to be more generous with our words. I won’t summarize the entire sermon for you, but I will tell you that the Holy Spirit REALLY convicted me. I left the church reflecting on my tone of voice and speech. As I often do, I jumped to criticize that church immediately, failing to notice many of the wonderful things that it is doing. I report negative encounters with friends and strangers to my husband, but I rarely report positive ones. I nag when my children fail to do their chores or do them poorly, but I rarely affirm much less praise their obedience. As much as I talk and purport to know about generosity, I am really stingy with praise, often critical, and have noticed that the tone of my home has been negative. I tend to blame the whining, arguing, and complaining on my children, but this sermon challenged me to think about the tone that I am setting with my criticism, my gossip, and even my harsh instruction. In setting the tone for my home, I’ve been stingy. In talking to my family, my friends, and my readers, I’m realizing that my experience is NOT unique. Many of us are struggling with an unpleasant tone in our homes. We WANT things to be different, but we are on the defensive against it. If you’re like me, you end up hearing yourself shout, “STOP COMPLAINING!” “Don’t be so critical of your sister!” or stewing over the dinner that nobody complimented. Rather than being generous with a positive tone, I end up criticizing the critical one. Sigh. Vicious cycle. SO, if you know me, you know where I’m going with this. . . .
Because learning with you helps me, I’m planning to spend 9 weeks digging into Scripture with a Thursday morning group from 9:30-11 AM, Jan 21st-March 17th. 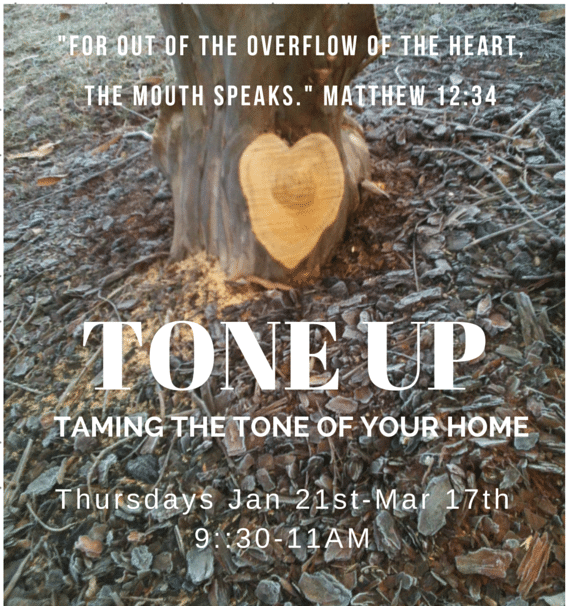 This group will be called Tone Up: Taming the Tone in Your Home. I will be posting insights into what we are learning on Monday mornings so we can prepare. There won’t be daily homework, but there will be a weekly blogpost and Scripture memory. There is FREE childcare!! If you plan to attend the live study, please make every effort to attend consistently. Sporadic attendance really affects the cohesiveness of the group as I’m sure you understand. To join the live study, email me at katrina at katrinaryder dot com. Indicate if you will need childcare. Also, whether you are joining virtually or in real life, request to join the Tone Up Facebook group. It is a closed group, so shared information will only be visible by members. Make sure you request to receive notifications from the group, and subscribe to my blog so that you receive the weekly reading to your email. I hope many will join as we encourage each other to Tone Up!